Feeling: Alright with the exception of thinking I developed another kidney infection. Rather than having a kidney infection my body was just telling me that I shouldn't be doing 9 mile hikes carrying a 16" and 4lb baby inside me. 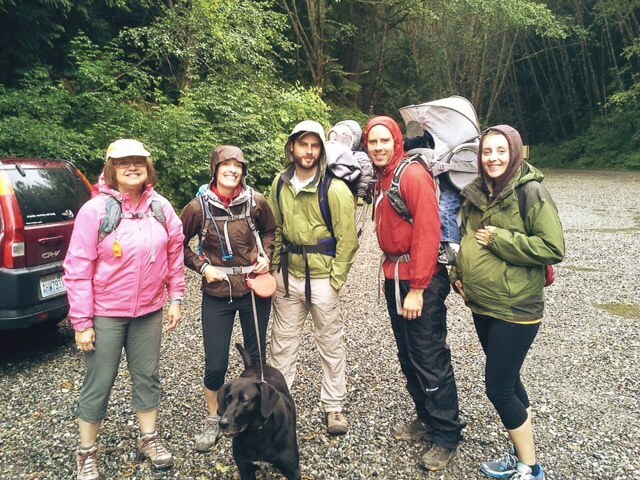 I really wanted to go for a hike when we got home from Japan since I love hiking the PNW and knew that if I didn't do it soon after our arrival the likelihood of getting to one this summer would be slim. 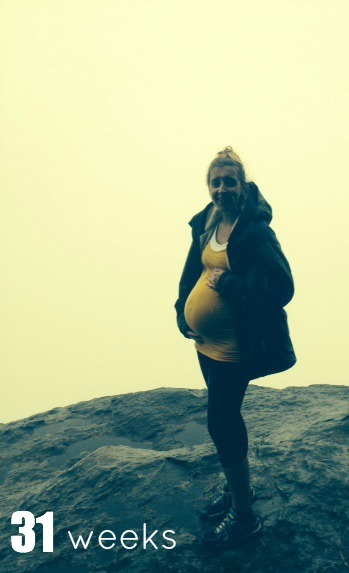 At the time, being 31 weeks pregnant didn't sound too far along for such a hike but my body definitely screamed to me that it was. The last three miles down the mountain were absolutely brutal; like I said, I thought I was experiencing a kidney infection again. The pain was so strong that it made my head fuzzy and my stomach nauseous. Once I got back to the car and sat, then soaked in the tub and ate, the pain finally dissipated, thank goodness! This is a picture of me at the top of Oyster Dome in Bellingham. You're supposed to have a gorgeous view of the San Juan Islands (right there behind me is at least a 200ft drop) but all we saw was a big wall of clouds. It was a VERY Pacific Northwest hike- cold and super wet. Weight Gain: Haven't been to the doctor's this week to get my "official" weight. Belly Button In or Out: It's more flat but kind of out. was a more fast pace active yoga and probably not what the chiropractor was thinking) and walked on the treadmill at the gym at an incline a couple days during the week. I did wind up doing one of my TurboFire low HIIT (low impact, high intensity interval training) workouts Friday just because I mentally and emotionally needed it (exercising really grounds me) and it went fantastic! The chiropractor business might actually be helping. Oh and then of course there was the hike to Oyster Dome which was also quite the workout, and probably more than I should have been doing this far along. Maternity Clothes: The weather has cooled off a lot the last few days which means I've been living in Christopher's clothes since the only maternity things I have are t-shirts and tanks. While hiking I wore his super warm and comfy LL Bean zip up and the shell to his Columbia winter jacket. Nursery: Still working on getting Gabriel out. Most of the big items are out of the second room, have to finish painting my craft hutch so I can move the rest of my crafting and sewing materials out to start painting walls. I've grabbed a good number of swatches by nothing is sticking out to me yet. I guess before I start painting I sort of need to pick a color. Movement: Baby is not letting me fall asleep easily in the evenings. Symptoms: Was feeling pretty fatigued and nauseous this last week. Morning sickness in the third trimester? Sleep: Besides being difficult to fall asleep, once I fall asleep I sleep rather well. As I said last week, so thankful for the new bed! PERFECT timing. What I Miss: When walking upstairs in my house didn't feel like I was climbing Mt. Everest. Best Moment This Week: We got to met our newest niece! My brother and his girlfriend just gave birth to the sweetest little baby girl! It's exciting that Baby Voth no.2 will have a cousin so close in age. Looking Forward To: I know I mentioned it last week but I am still looking forward to our anniversary weekend. This will be our first overnight without Gabriel ever! Can not wait! Where are you guys going for your overnight!? Beautiful hike photos, mama! We're planning a ladies hike to the Oyster Dome next month! I didn't realize that we live in the same area! Is the hike really steep? I'm a bit nervous! We're going out to nice dinner in Tacoma (probably the nicest I have ever done to date) and then spending the night at the Alderbrook Resort! Have you been there? It's on the Hood Canal and is wonderful! Yep, we are in the same area-ish. :) I live in Kitsap county but have family up in Bellingham. The hike is only step the last couple minutes and REALLY steep but doable and goes rather quick. Compared to other hikes I've done in the Olympics it wasn't steep at all but I'm a huge alpine view hiker. It's a pretty awesome corner of the country. It's hard for me to picture having anywhere else be home base for us. I hope we have fun too, SO GIDDY! Alderbrook has a really amazing restaurant! Just sayin'. Best clam chowder I've ever had, and we had breakfast in bed room service that was amazing too! :) Justin and I stayed out there in April after hiking for our first overnight getaway alone. I was also supposed to get married there back in 2009 when I was engaged before. Anyway, I really love Alderbrook! I hope you guys have a wonderful, wonderful time!! Yea I remember them having really great eggs Benedict! I can't remember if I knew you were engaged before or not, Chris and I were just talking about people breaking off engagements the other day- about how brave of an act that is. A friend of mine almost got married there but went with Port Gamble instead, it's so great! You are going to have a wonderful getaway!! It certainly was an act of bravery, but one I couldn't have done without the support of my family. I called the wedding off one month before I was set to walk down the aisle. Best decision of my life.